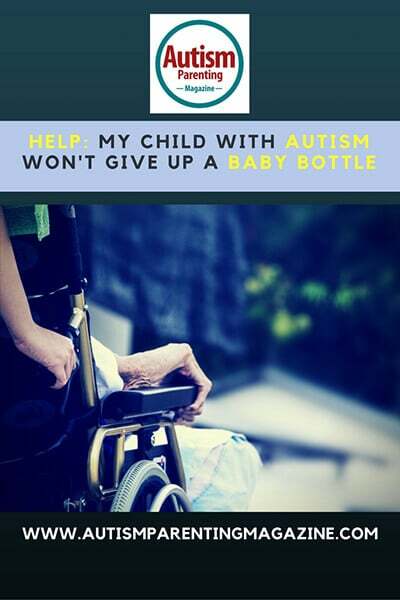 My six-year-old son has autism and refuses to drink from anything other than his bottle. He has tried a sippy cup a few times but just won’t give up the bottle. What can I do? 1. Put your child’s favorite drink into the sippy cup and put a non-preferred drink in the bottle. For your son this may look like putting milk into the cup and water or a bitter juice into the bottle. Doing this will help pair the new cup with an old, familiar favorite. At the same time, it will make his bottle less appealing to him. This technique helps make the sippy cup more interesting and attractive while making the bottle less enticing. 2. Reward drinking from the new cup. Just like teaching any other new skill you can reward your son for using his cup by giving a treat, affection, praise, toy, or whatever it may be that motivates him. Start with a small expectation like just putting his lips to the cup. If he doesn’t actually drink, that’s okay, reward him anyways. Immediately give him whatever it is you’ve decided on. Once he’s okay with that you can make it a little harder such as trying to take at least five sips. Again, if he doesn’t actually drink, that’s OK. Reward him anyways. Eventually the goal would be to get him to take a real sip and earn a mega, massive, huge reward from you. Maybe it’s his favorite candy. Maybe it’s the iPhone. Whatever the reward, make it something special that he doesn’t get regularly and give it to him right away. 3. Get rid of all the bottles. You may not like this idea, but hear me out. As long as bottles are an option for him he will likely never choose a cup. Think about it: why would he out-of-the-blue choose a cup when all his life bottles have worked just fine? He is not going to suddenly change his mind. By just taking the bottles away as an option you are giving him no other choice but to learn the cup. It may be hard at first, and there may be a few days of tears and meltdowns, but I promise you he will eventually learn to just use the cup. To help this transition go smoother you can also choose cups that are his favorite color or have his favorite characters on them. You can also try giving him the choice between several cups so that he can share some control over the situation. By offering him 2 or 3 cups and letting him pick which one to use he may be more likely to use it. I hope these help and wish you the best of luck! Angelina works as a Board Certified Behavior Analyst, specializing in assessing and treating children and adolescents with autism, down-syndrome, and other developmental delays. She began her career in Applied Behavior Analysis in 2006, following her youngest brother’s autism diagnosis, and has since worked with dozens of children and families. She also writes a blog about her experiences as both a professional and a big sister. Her brother, Dylan, remains her most powerful inspiration for helping others who face similar challenges. My 6-year-old daughter with Autism is also addicted to her baby bottle. She only drinks milk. She refuses water and juice, even milkshakes. Two occasions we have tried to go cold turkey with her and both times she ending up in hospital being sick and dehydrated. I am now scared of this happening again but also desperate for her to drink from anything but the bottle. Her teeth are suffering. We remove the bottle from sight when she is not drinking and we offer her sensory chews. Her 2-year-old sister is refusing to give up her bottle, we believe she is copying her big sister. My 5 year old son has autism. And only takes a bottle of milk at night, and it’s rotten his teeth. Any 1 any ideas wot I can give him instead of a bottle. I have tried every kind of cup but he refuses to use them at bedtime.